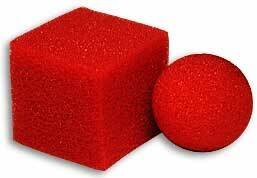 A sponge cube is displayed to the audience. The magician shows his left hand to be empty and then closes it into a fist. The cube is placed on top of his fist and pushed down inside with the right index finger. The magician then asks the audience if they know which hand the cube is in, but their answer makes no difference-the magician opens both hands to show a sponge ball in each hand! I didnt buy this from here (its cheaper here than from where ..